This project aims to measure the biophysical properties of white matter tracts that connect seizure-generating networks in idiopathic generalised epilepsies, using magnetic resonance imaging. We hypothesise that the degree and pattern of tact abnormalities can be used as a personalised diagnostic and possibly prognostic biomarker. Human epileptic seizures arise in cortico-subcortical networks, and depend on the white matter (WM) connections that subtend these networks for propagation and behavioural expression1. The idiopathic generalised epilepsies (IGE), a common group of genetically determined, phenotypically overlapping seizure disorders that predominantly affect adolescents and young adults, show common structural WM alterations in an extended network comprising thalamus, striatum, areas of the sensorimotor network (SMN), and regions of the so-called “default mode network” (DMN), a parieto-prefrontal system that seems to be pivotal for healthy brain functioning and the maintenance of the vigilant conscious state1–4. Although these common structural alterations suggest a shared biological basis of IEG, their pathophysiological and clinical implications are poorly understood; in particular, their relationship to phenotypical variability and disease severity remains to be established. To address these knowledge gaps, we propose to conduct a cross-sectional case-control study in a mixed cohort of IGE patients and controls in order to measure changes along thalamo-cortical projections to, and along connections within, the SMN and DMN, using advanced quantitative assessment of WM tracts with magnetic resonance imaging. We hypothesise that, compared to controls, patients will show increased SMN connectivity, reflecting seizure-dependent plasticity, and decreased DMN connectivity, indicating the disruptive effect of seizures on vigilance. 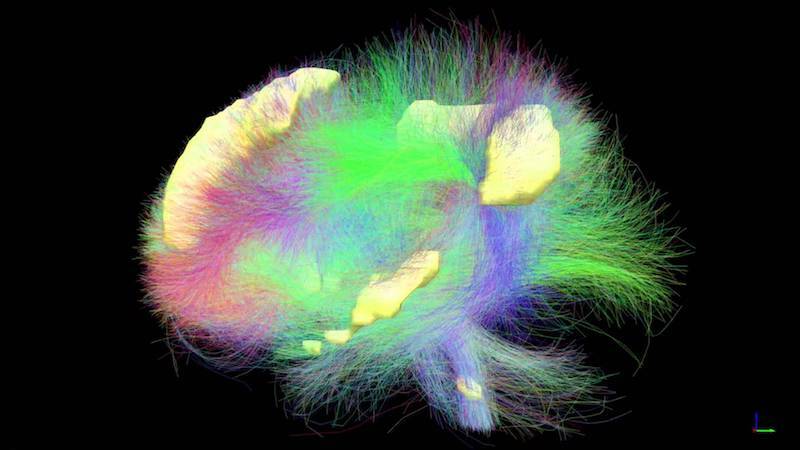 We further hypothesise that disease severity will scale with the degree of interhemispheric and thalamo-cortical connectivity alterations within each specific network. To test these hypotheses, we intend to acquire the following neuroimaging protocol (lasting ~45min.) in IGE patients and controls: diffusion data with multi-shell high angular resolution diffusion imaging (HARDI)5, and qMRI data with multi-component driven equilibrium single pulse observation of T1/T2 (mcDESPOT)6. In a first analysis, we will localise group-wise connectional differences using whole-brain comparisons of WM fibre densities7. We will then reconstruct, for each subject, the tracts identified at the group level and map quantitative tissue properties along each tract’s extension. To assess disease severity, we will conduct long-term electroencephalography (EEG) for 24hrs in each patient. As a measure of severity, we will count generalised spike-wave discharges (GSWD) using unbiased automatic algorithm8. We will furthermore calculate measures of seizure propensity from EEG-segments without GSWD, using a generative approach that models brain network dynamics from scalp EEG data9. Finally, we will use probabilistic machine learning algorithms to classify patients versus controls, and to predict number of GSWD and seizure propensity, based on these quantitative tact profiles10. Our sample size estimations based on clinical T1-weighted data suggest that we will need n=23-25 participants per group to achieve 95% classification accuracy. In sum, the overarching goal of this project is to investigate whether quantification of WM connections that are the substrate of large-scale brain networks can be used as a personalised biomarker of patients with IGE. If successful, potential applications of the proposed method could be broad, e.g. to diagnose IGE already after a first seizure, or to monitor disease progression over longer periods of time. The Richardson Lab comprises a team of researchers from several different disciplines, including neurology, psychology, engineering and physics. We study the brain as an entire functioning system, rather than studying small components of the brain. For more information about our research projects, or to find out more about our visitor programme, please contact us.